Most of this menu came from ideas out of the New York Times recipe archive, specifically “The Passover Table” section. While not a Passover meal I was intrigued by some of the combinations. Plus the weather was (just barely) warm enough for me to grill for the first time this year. I was a bit worried that the meal would come out too sweet so I made a couple of recipe modifications in the haroseth and casserole that seemed to help moderate the sweetness. The radishes (see photo) were a revelation. 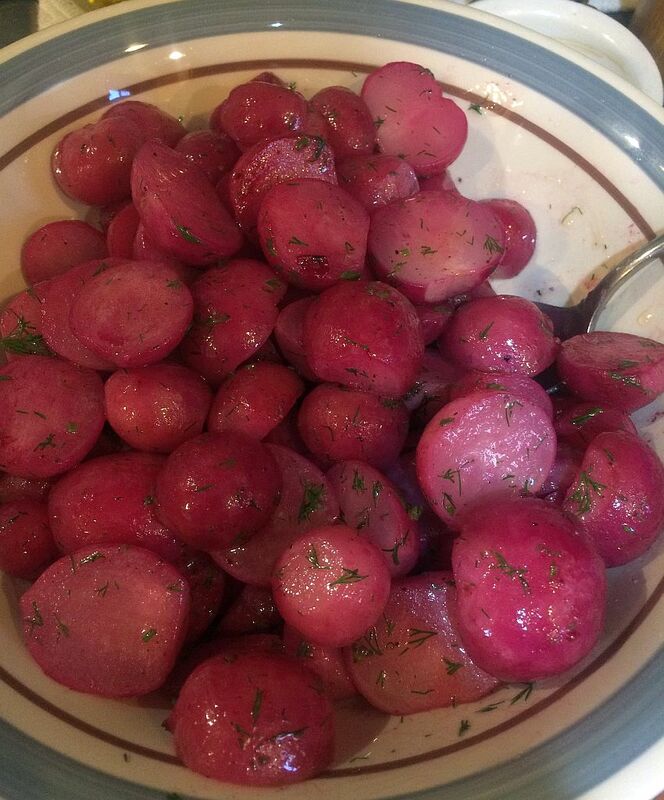 In the dish they look almost like baby red potatoes. The taste is a very mild turnip flavor. They don’t come across as overly buttery. Dinner tonight is brought to you by a random click on an ad on Facebook that brought me to a New York Times recipe that wasn’t as interesting as it looked. That said I liked the concept of chicken with mustard so I thought I’d figure something else out which worked out really well. This meal turned out to be very colorful on the plate. I’m very happy with how it came out. I made these for a pot-luck event I attended recently. I had a partial bag of M&Ms that I wanted to use up (so I wouldn’t keep eating them by the handful). I decided I wanted a soft cookie rather than a crisp one. There are multiple ways of doing that, though I’ve had varying degrees of success with them. More brown sugar than white seems to work best for me. The rest in the fridge helps as well. These stayed fairly soft for the first couple of days after I made them. After that they started to get a bit stale. 5 seconds in the microwave did a far job in reviving them. Combine flour, cornstarch, soda and salt in a bowl and whisk to combine. Set aside. Combine the egg and vanilla in a small bowl; scramble until combined. Set aside. In the bowl of a stand-mixer, combine the butter and sugars. Beat on medium high until well-creamed and butter has lightened in color. Add the egg/vanilla mixture. Beat until combined with the creamed butter and sugar. Add the dry ingredients to the creamed butter mixture and mix until just combined. Add the M&M and fold in until well distributed. Line a baking sheet with plastic wrap. Using a #40 disher to scoop out cookie balls. Fill the baking sheet, cover with plastic wrap, and refrigerate for at least 2 hours. You can actually keep them in the fridge for a day or more in this state. See the notes at the end for longer storage options. When the dough has rested for at least 2 hours preheat your oven to 350°F. Line another baking sheet with parchment and place 12 cookie dough balls on the sheet. Bake for 8-10 minutes, rotating the pan halfway through cooking. The cookies are done when the edges have just set. The tops will appear slightly underdone. Allow the cookies to rest on the baking rack for 5 minutes before transferring to a cooling rack. Repeat baking process until all your cookies are baked. Cookies should be cooled completely before storing in an air-tight container for up to a week. Unbaked cookie dough balls can be stored in an air-tight container, in the fridge, for up to 5 days. Bake them up all at once or enjoy freshly baked, warm cookies, for a week. This recipe borrows heavily from one by Averie Cooks. My husband asked if I would make Milk Can Supper earlier this week. What’s interesting to me is that this simple recipe blew up (at least for me) on this blog over the last month. I went from maybe a dozen hits per week to 80+ hits in a single day. It happened several weeks in a row. I can only guess that Cook’s Country reran the episode that included the dish and Google led folks to this blog.